That rough beast, its time come round again, slouches toward the Nebulas to be born — er. Hi. It’s apparently award season in SFF-land, and I am in the business of misquoting Eliot for fun and profit. Self-promotion is the order of the day. (My own ‘best of’ will show up sometime in December.) Awards season is like election season: breathless, continuous, and longer than you think. The Nebula Awards have just opened for nomination, and will be open through February 15; the Hugos will be along shortly, I’m sure. Nebula nominations are reserved for members of SFWA (at any level) — there’s a nice explainer here on the SFWA site — and the Hugos are open to anyone who buys a supporting membership in this year’s Worldcon. Most of you know this, but every so often I feel like we should be a little more transparent for those of us who don’t, or who are new. I have two short stories which are eligible this year, both of which I am amazingly proud of. If I have to pick one, however, it is “The Hydraulic Emperor”, in Uncanny #20: about obsession, film collectors in space, sacrifice auctions, and weird alien nihilism. Also there’s the worst Grail quest pun ever. 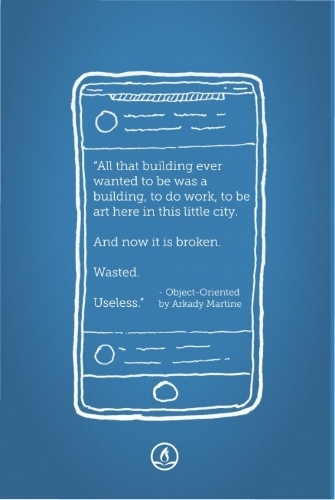 I also have a piece of long flash in Fireside this year, called “Object-Oriented”, which is being reprinted in the Hope in This Timeline micro-anthology Fireside is putting out. It’s one of the few near-future pieces I’ve written, and one of the first that came out of my new work as a city planner with a real interest in hazards and disasters. I’m so very glad I got to have these two stories out in the world this year — next year, more, and also next year, a whole novel. But these two, I’m proud of. It's March, and there's a nor'easter battering the East Coast -- so I've brought you a story about wandering through deserts. This is a story I could not have written without being a Byzantinist -- without being a historian, which is in many ways a thing that talks to the dead. I wrote a version of it at white-heat in the deep winter of January 2012, in the University of Chicago library. I like writing desert horror in the winter. (I like writing desert horror in general.) "Adjuva" was the second story I wrote after I decided that I was going to be serious about writing, in the sense that I would send my work to magazines. Naturally, having decided to be commercial, I promptly spat out some of the most personal, emotional, high-concept, requires-a-goddamn-Masters-in-Crusade-Studies-to-read stunt-writing fantasy I was capable of producing at the time. I used to call this thing “Vladimir and Estragon Go On Crusade”, seriously. It is my love-letter to Crusader chansons and the Gesta Francorum and the first trip I ever took to Turkey and all the unhallowed dead. To the complexity and horror of medieval theology, and to the untold stories of Crusading -- the Byzantine stories, the Islamic ones. It is -- years before I studied narratology professionally -- a narratological story, about memory and narrative-construction and the ways in which telling stories bends time until it kinks around a point. "Adjuva" is also a study in persistence: the first time around I sent it to sixteen magazines before it got picked up. By the time it sold I had rewritten it substantively. Somewhere around magazine #8 I knew it was broken, and even knew why, thanks to an astute editor and a kind personal rejection, but was flat-out unable to fix it -- because the problem was in fact theological. This is a very Catholic story — I’m a very Jewish person, for all that I don’t practice as much as I could — and sometimes I felt like I was wrestling with God, trying to find a way to let Michel have a way out that did not strike me as ethically monstrous. To write an ending where surrender was not only permitted but correct. But wandering creates the desert. And narrative is a form of wandering, and a desert in its own peculiar way. 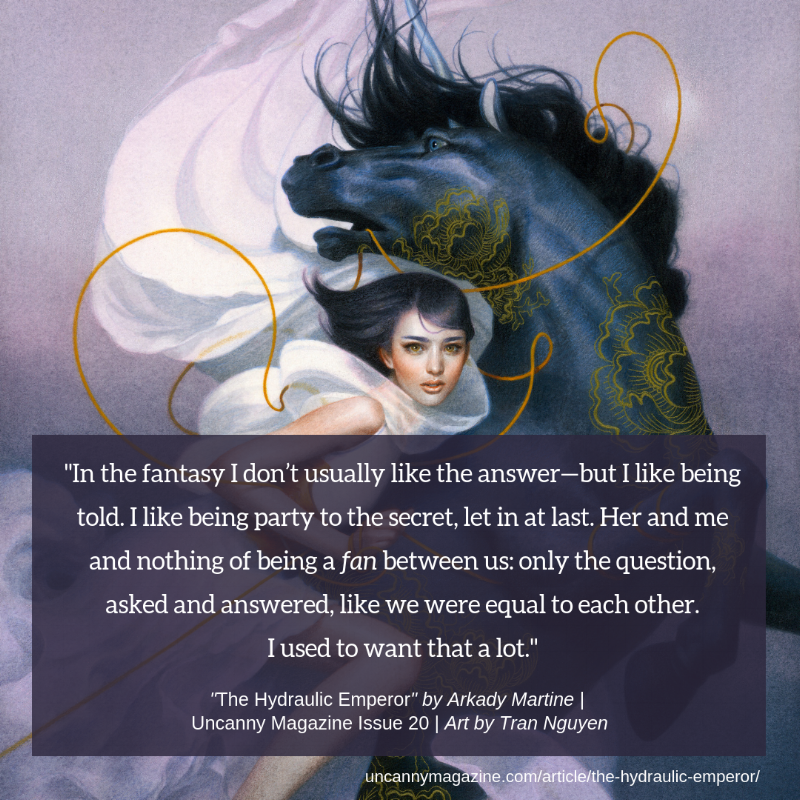 My newest short story, "The Hydraulic Emperor", is available online now in Uncanny Magazine #20: https://uncannymagazine.com/article/the-hydraulic-emperor. This is the first story I've sold to Uncanny (after many attempts!) and I'm exquisitely pleased and honored to share the table of contents with a whole group of my dearest friends in-genre: how lucky I am to get to have a story in the same issue as Elizabeth Bear's masterful and heartbreaking tory "She Still Loves The Dragon", John Wiswell's deeply insightful essay "The Stories Our Games Tell Us", and Fran Wilde's viciously important creative-nonfiction piece, "We Will See You Now". And that's just (part of) the first half of the issue. In February the other half goes live, with stories from Marissa Lingen and my own beloved wife, Vivian Shaw, who has written a piece of near-future hard SF horror that squicked me, and that's saying something. (I'm very proud of her). This is wonderful company to find myself in. I'm glad it's the company I got for "The Hydraulic Emperor", which is one of my favorite pieces of my own work, and one I'm desperately proud of. It's about sacrifices, and being a fan, and collecting beautiful things, and aliens, and solidarity, and I got the idea for it from an AV Club article by Ignatiy Vishnevetsky back in the dim dark December of 2014, when I was living in Fredericton, New Brunswick and thought it would never stop snowing. It took me three years to find the right way to tell it. It turned out that what I wanted to do, really, was try to write as if I was Burning Chrome-era William Gibson. The part of this story that doesn't come from Vishnevetsky is right out of Gibson's "Hinterlands". I like thinking about objects, and what people will do for them. People are fascinatingly nasty about wanting, even when they know wanting is actively destructive. Also I got to name a place the Hotel Terminus, which may be the most Gibsonesque thing I will ever do. I hope you read it; I hope you enjoy it. I'm looking forward to 2018 in short fiction -- I'll have at least one other story soon, and hopefully more in the later months of the year. Short fiction remains an entire delight of mine, the skillset I'm most comfortable in, the playground to test ideas and make tiny, perfect, vicious little worlds. It's been great to get back to it, briefly, before I embark on novel #2. From a strange and delightful boutique hotel on Chambers and West Broadway, with a 19th-century map of lower Manhattan carved into the shower tiles like a strange and unexpected hello, I know you gift: guess what, we lived. Happy almost-New-Year. I'm getting married in sixteen days. Throw-a-giant-party married, rather than legally married, which we've been for a while now. My wife is right next to me, playing with fountain pen inks -- she acquired this hobby by contagion from some of our other writer friends, and I am showing the first signs of infection -- and god, I am so lucky, and here is one of the ways we lived: this time last year I was terrified we'd lose the ability to be married before we got to ever do it. And so far: so far not yet. But these small things, too: a woman I love loves me, and we have had our first full 365 days together, one entire trip around the sun, and we still love each other, and we build a life, piece by piece. Her book came out in July. We went to Sweden together in August. I got an agent and sold my book and used part of the advance to pay tuition on a master's degree in urban planning. We acquired tiny plants, and killed some of them, and didn't kill others. We bought ridiculous amazing octagonal black tableware. And furniture. And books. And after a while I stopped having to go back across the Atlantic and it's just been -- us, together, piece by piece. Even while the rest of the world seemed to shatter slowly. I wrote -- not less than I planned to, though that's also true (my academic monograph is going to be Very Late, sigh), but differently than I planned to. I finished the novel and then I added nearly 30,000 more words to it in a structural edit after it was sold, and that was hard, and that was amazing, and I'm very proud of it, and very glad to have had the help of my editor at Tor, Devi Pillai, to show me what I could do. I wrote a grand total of two short stories. (Sold both, at least.) Wrote a lot of academia. Articles, classwork. Wrote -- 2/3rds of that academic monograph, some of which is really good, some of which is tied irrevocably to how I seem to have slipped out of the spinning wheel of postdoc academia and into a sideways other life where I ... am going to build cities that don't drown, and sometimes write about Byzantium and empires and dead languages, but mostly not. I am complicatedly good with that slip, right now, in the heart of the city I want to serve. I am angry, and will always be angry, at the way academia did not value my labor enough to pay me a living wage and provide me job security of any kind, but was happy to publish me and invite me to present my work. I am angry at being denied. But I'm good with the choice I made in the face of that denial, which was to find a new way to be useful, and to learn, and to -- oh, to be terrible and dramatic about it, to find something worth serving. This city, New York, which I love. Other cities, too, but here first and here because. In the Union Square Christmas market, last week, Viv -- my wife (I still can't stop saying that) -- found a tiny shop selling reclaimed artifacts from NYC abandoned buildings, made into jewelry. There was a necklace there made from a 1950s subway token -- one from between 1953 and 1961, because it was a NYCTA token, not an MTA one. I spent a lot of time this fall writing about the NYC subway system, for both non-fiction and fictional purposes. I bought the token-necklace. I will wear it. Sometimes the universe tells you you're doing the right thing. I wasn't sure, last year, that we'd get this far. I wasn't sure that I would. I have not been strong. I have been positively friable. But: hey, darlings, we lived. And it is a New Year, and this is the best holiday: throw yourself into the future. Hold hands and raise voices. Celebrate with me when we can. Reach. see you in the morning, universe. 2017 has been an excellent year for me as a writer. Nevertheless, this is not a post about the many things I have written which, if you happened to have liked them, you could nominate for Nebulas or Hugos or various other shiny things. It’s not that I’m against awards-eligibility posts, ethically or aesthetically; I rather like them, both as a way of marking my own achievements for myself and for the sake of summarizing the work done in a year and sent out into the world – and I am completely unashamed about the self-promotion aspect, the outward-facing hey! I made stuff! Remember? Which is how the best of that sort of summary works: a moment of reification of the writer-self as an evaluatable object, a thing that can be spun and held up at angles to see how the light goes through. The weird thing is that because 2017 has been an excellent year for me as a writer, I have … only one published piece of fiction in the year 2017. (I’m very fond of it – it’s called “Ruin Marble”, it’s about a possessed radio, fallen angels, the NYPL, and how to stop being an evil sorceress, and you can read it over here in Mithila Review 9. Critically, this story sank like a stone into a deep lake, without a ripple to mark its passing. So it goes. I like it; it’s in the world to read; that’s what matters.) Why only one published piece of fiction? Because even in the world of short fiction, there’s anywhere between a three- and nine-month delay between sale and publication – sometimes longer. So a story that came out in May 2017, like this one did, might have been sold in December 2016 … like this one was. So the real question when a short fiction author who’d been averaging five to seven new stories a year suddenly drops to one story published in twelve months is jeez, what were they doing in the year previous to the year that the number dropped? What did I do in 2016, essentially. Here is a thing that I have learned: if, by chance, you spend 2016 visiting 11 countries for work, meeting the love of your life and getting engaged to her (thus beginning a pattern of bouncing back between Eastern time and Central European time in alternate two and six-week swings), attempting and failing to win at the academic job market, figuring out what you want to do if you’re not going to do academia and setting that project (city planning! Climate change mitigation!) in motion, being violently traumatized by the political implosion of your country, and finishing a novel? You sure as hell are only going to write one short story in 2016. I mean. If you’re me. And then in 2017 I spent the first half of it revising that novel, getting an agent, and having that agent help me sell it. (Which is why 2017 has been a great year for me as a writer.) I didn’t get the space or time to write short fiction again until June. (Sold the story I wrote in June – but guess what, it’s in the January-February issue of Uncanny.) And then another short story in September. (Sold that one too – but it’ll probably be in Fireside sometime around March.) Haven’t done much other short fiction – too busy revising the novel, now to editorial specifications. People in the publishing industry talk a lot about the delay between the time when you finish your novel and the time when it’s published. Mine doesn’t come out til 2019. But I don’t think we often talk about the balance between producing short fiction and producing longer work, or about how short fiction publishing also has delays built in. I feel like I’ve had the most successful year of my life as a professional writer this year. And yet: just one story for you to look at! It’s the balance that interests me, not the lack of possible award nominations. The tradeoffs between writing short and long, between projects that take years to come to fruition and projects that take months. I keep thinking about how this interacts with the necessity of keeping your name in the wind, as an author: you don’t’ want to vanish for a year, in terms of having people remember you exist. If I was just breaking in – if this was my first year, or if I’d had just one six-story year and then went dark – it’d be a lot easier for people to forget that I existed. Which of course is the fear. (I’m not worried now. I have a track record, and I have some very flattering anticipatory interest in the novel. But the fear is there, lurking.) As I’m shifting from the phase of ‘breaking in’ to the industry to ‘being a debut novelist’ – especially coming from being a short fiction person first and primarily – I am beginning to spend some significant time thinking about how to better control the ebbs and flows of publishing speed to produce a more linear narrative of authorial presence. It’s a strange place to be in, this transition; a lot of people don’t come from short fiction first, so their breakthrough moment is that first novel. But for me, what I’m experiencing right now feels more like a state change: possibly from apprentice-writer to journeyman. There’s a whole new set of skills out here in novelist land. One of them is going to be time management on a years-long scale. I am on the subway, the 1 line, somewhere under City College. I’ve come up to the city to vote, because I can’t not, right now. I have almost always voted – I was raised in it, taken to the polls with my parents, allowed once to yank the huge lever for my father back when the machines had levers to yank, that satisfying thunk sound – but I have not understood voting as a compulsion before this year. I have not understood voting as a particular form of civic sacrality. A consecration: dear city of my heart, dear my broken and disastrous nation, these fifteen minutes of my life belong to you. I inscribe myself on the shape of your future. The ‘I Voted!’ stickers in New York State this year have a picture of a suffragette with a megaphone on them. They say, celebrating 100 years of women’s suffrage. Did you know it has been a hundred years? I had somehow, in the violence and the despair and the narrative-breaking horror of the first year of President Donald Trump, entirely forgotten. On the subway standing next to me is a woman who is wearing the same sticker. She is young and dark-haired and startlingly beautiful, deep red mouth and a shearling jacket in grey and black. We see each other’s stickers. We look at each other’s faces. We smile, flicker-fast, mutual recognition. And I think, as sharp and as fast as that stranger’s smile, what would it be like to be celebrating in that other world where my president was a woman? I think in that world I might not be writing this blog post. I think if I was writing this blog post in that world I would have talked about the bright arc of women reclaiming what we have been denied. I think I would be writing about joy. I saw a thread on Twitter yesterday about trauma anniversaries. In the past three weeks I have been knife-edge fragile, balanced carefully between being the only one of my friends and colleagues who is willing to profess climate optimism, and being the one of my friends and colleagues who cannot bring herself to imagine a future where climate optimism had time to flourish. I think of all the joys upcoming in my life – my wedding, in January; my academic research being published in late 2018; my novel being published, in 2019; working as a city planner, moving back to New York to do it, in the nebulous world of 2019-2021 – I think of joy, these past three weeks, and I am plunged, Pavlovian, directly into blank despair. Nothing matters, I think. Nothing matters anyhow. None of it will happen. We are all already dead. This is a trauma response. Intensification of anxiety and irrational patterning of thought is common around the anniversary of trauma. But god, PTSD? Over an election? Really? This too is a trauma response. So is – in a fashion – voting. Voting not just with grim determination, but with purpose and with as much joy as I can muster up. One hundred years of women’s suffrage. I inscribe myself into the future of my broken and poisoned nation. A stranger smiled at me on the train and I thought: oh. We are still here. I rode the subway to Penn Station and I bought a coffee and I drank it fast enough to burn my tongue, and read on my phone an essay written by a Philippino writer, Dimas Ilaw, in Uncanny Magazine. The essay is called “The Shape of the Darkness as it Overtakes Us”. It is not easy to read. It is an inscription, too: it inscribes names and blood and death, and a violence that lives inside the skin of a people and devours. It is a beautiful essay. Ilaw is a magnificent writer. I drank my coffee and tasted cardamom and cream and thought: my broken and poisoned nation. Your broken and poisoned nation, Ilaw. I see you. I hear the names you speak. Reader, I am writing this for you. I do not know if you are a Filipino; I do not know if you care about what is happening in the Philippines. I do not know what is happening in your own country or whether those you care about are safe. I don’t know your politics or whom you support or anything about you; all I know is that I have to tell you this. Your reading, too, is resistance. I printed my train ticket. I have to go to the campus at which I am currently getting a degree in urban planning, and I need to be in class tonight, so I will travel down the Eastern Seaboard and I will do good work today, and wear this sticker, which is very small and not that sticky anymore even two hours after I put it on. I printed my train ticket and I leaked tears from the corners of my eyelids and smeared turquoise eyeliner down my cheeks. “We will refuse the silence just as we refuse our annihilation,” Ilaw says. A stranger on a train; her lipstick, her secret shared joy that was also mine. Throw yourself into the future like a stone skipped on a lake: let that stone be an ostrakon. Inscribe the world you want onto the face of the world we live in. Voting in America, election day 2017.